Product prices and availability are accurate as of 2019-04-01 09:41:04 EDT and are subject to change. Any price and availability information displayed on http://www.amazon.com/ at the time of purchase will apply to the purchase of this product. 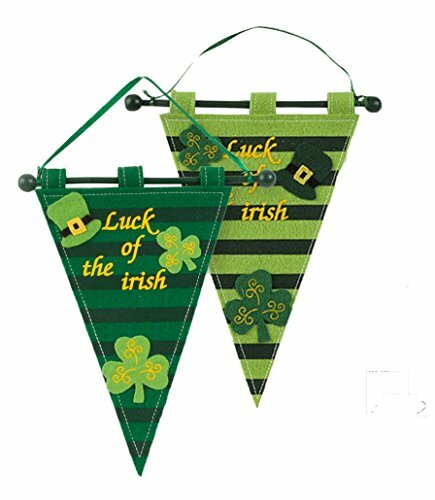 Add a lucky look to any space with this festive St. Patrick's Day Shamrock Pennant Banner. Drape this Irish Flag Banner on a shelf, in a doorway or over a window for the perfect look this St. Patrick's Day. 2 Designs Dark green and light green with "Luck of the Irish" printed on each with 2 shamrocks and a Leprechaun hat glued to it. It hangs on a wooden rod with a green ribbon. Great addition to your set Patrick's day celebration and party décor! Each Felt banner includes 2 13" x 8" pennants. Rod is 10" long.